Highlighting is an extremely successful make-up method that enhances and brings out certain features of your face. Depending on the shape of your face, different areas are better suited to highlight opposed to others on someone with a different face shape. The whole process needs to be specific to every individual. There is no specific protocol for everyone because no one looks exactly the same. Although challenging to put into words and on paper, reading about the technique can help you gain the general knowledge and understanding of the procedure so you are prepared to apply it all by yourself. Before anything does get applied, you want to make sure that your face is correctly prepared so that the make-up glides on smoothly and doesn’t look caked on. It is important to remember that with any product that you are using, it’s best to start with a small amount and add more if needed; by doing so, your make-up won’t look too heavy, and you also aren’t wasting any of the product. First complete your daily skincare and sunscreen regimen and apply a primer to your face. A primer has a silicone texture and is used to coat the epidermis so that the make-up doesn’t penetrate deep inside your skin and clog your pores. It provides a smooth start to the application process. Apply your foundation, then your concealer, and then set with a translucent powder. After all this is complete is when you can begin the highlight process to define your features. The regions you will focus on are under the eyes, the brow bone, the bridge of the nose, the middle of the forehead, and the tip of the chin. Blend them in with a Beauty Blender sponge or foundation brush. See below. Now that you have completed your highlight, it’s time to get to contour. 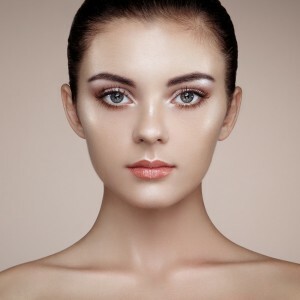 Contouring is a highly effective make-up technique that if practiced and applied correctly, can truly camouflage/conceal specific facial features. You don’t have to be a professional makeup artist in order to achieve the look you desire. Whether you want to make your nose look thinner, your forehead smaller, your jawline more defined, or your cheekbones more pronounced, have confidence that you will be able to enhance your naturally beautiful features all on your own! 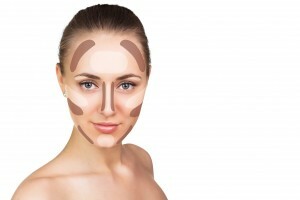 What you are essentially doing when you contour is camouflaging certain features that you want to conceal. Essentially, contouring makes those features go in where highlighting makes them pop out. The make-up used to contour should be significantly darker than your skin tone. It may look ridiculous at first but it eventually will blend in. Typically, you can start with your cheekbones but there is no specific order. A little trick to map out the cheekbone area is to use a spoon. Cover your cheekbone with the spoon and trace the area along the bottom of the spoon with the dark brown contour color to create an oval shape; this helps your cheeks look fuller. Perform the same technique on the opposite side of your face. Line the bottom edge of your jawline on either side and also around the top of your forehead, adjacent to your hairline, extending down to your temples. Lastly, contour the nose and draw a line on either side of the bridge.